Gin Lane, like most great Aussie ideas, began after a few drinks at a BBQ. Founders Paul, Lindsay, two Poms, were enjoying one of those very ‘British’ drinks, a G&T. They got talking about how much they loved gin and how impressed they were with the growth of the craft distilling scene, especially in Australia. Perhaps it was the gin talking but this rapidly moved to ideas about ways to share their gin passion through a great business idea. Without boring you with the rest of the night’s conversation, Gin Lane was born. We decided early on that this would be about premium gin, not the mass produced stuff you get in almost every bar, in every town, in every country. No, this was going to be about the special stuff; the craft gin, the small batch or boutique gin, lovingly prepared by passionate people. We also believe in supporting local, craft producers, so we plan to only import gin when we find something special from overseas. We have spent months scouring the country for the best Australian gin and we’ve been surprised and delighted by what we’ve found. It turns out Aussies are damn good at making gin! While gin making, and appreciation, is growing again around the world, in Australia there are now more than 40 gins being produced by a range of incredible distilleries. Talented distillers are bringing new flavours to gin that are quintessentially Australian – lemon myrtle, finger limes, lilli pilli and more. To whet your appetite here’s a few facts and bits of history you may not know about gin. If it sounds like you’ve come down the right lane, join up and experience everything Gin Lane has to offer. Why are we called Gin Lane? 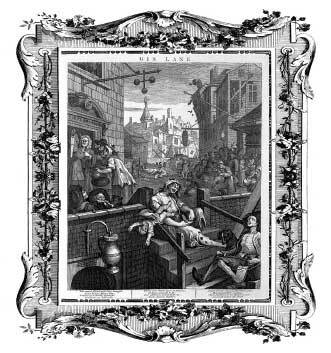 Our name is a nod to a famous painting by William Hogarth and a reminder that gin today is a very different drink to that of 17th and 18th century London. In those days, gin was considered the drink of the down and out and beer was the drink of choice for the gentry. How different things are now. Hogarth’s now famous print is described by the BBC as “arguably the most potent anti-drug poster ever conceived”. It was produced in support of the Gin Act of 1751 and along with ‘Beer Street’ was designed to show the relative merits of beer drinking over gin. Gin Lane depicted horrific scenes such as a woman letting her baby slip from her arms while she takes a pinch of snuff. Beer Street in contrast depicts a scene of healthy, happy and prosperous London citizens. We wonder if the prints were to be produced today, which scenes would be depicted in Gin Lane and Beer Street?